We've been clearing out the inlaw's house. They went to assisted living about a month or so ago. Wow, what a mess. They had only lived in this house for a little over 10 years but they had so much stuff. We found a whole plastic tote of cell phones. There must have been 10 or 15 of them! So it's been a big job and I'm thankful they didn't have a bigger house. Anyway, yesterday I found some old white sheets. They were soft and well washed but the fabric seems strong. I'm just finishing up the "Dogs in Sweaters" quilt and will post it as soon as it's quilted so I'm thinking this is the time to start on a string quilt. I saved a video from the Sat morning quilting show about a really cute string quilt idea. I think I'll watch it again and do some cutting this week. I'm excited about this project! That is on my list. I think i made one but it's still a UFO. black and white with orange. I must get that one out!! 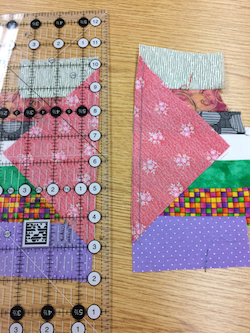 Lots of patterns for string quilts or just make up your own. Thay can be QAYG or just make as a regular quilt. a good way to use up some strips. I have lots of them planned, waiting until I use up the bigger scraps so I can use all the leftovers. HAHA, you never use up all the scraps. You can also use those sheets for quilt backs. I do this a lot and it works great. Old sheets would be a great foundation for a string quilt. I read somewhere about a quilter using used dryer sheets also. I noticed they are rectangular - may just make one like that. I generally cut an 8.5" square out of flimsy paper, like old phone books. I love string quilts...they are fun and don’t have to be precise. I keep a bin of strip fabric and throw in all lengths. I have about 40 blocks I’ve done here and there and will someday have enough for a quilt. I will have to see if I can find the Saturday Quilt Show episode. Can’t wait to see your progress...keep us posted. A tip for your string quilt: no matter how ugly a fabric may be on its own, it will work great in a string quilt. First one I made I purposely used all fabrics that were really ugly (from scrap bags) and it's been my prettiest string quilt so far. The ones I made that were "planned" have never turned out as nice. It contains a link to the tutorial on the forum & has been easy to follow. All my blocks are made (navy triangles for the center have run out) & I began joining blocks last night. I’m eager to see the completed top! What is the Saturday quilt show you are mentioning? I have backed charity quilts with sheets from Goodwill, more than once. I say charity quilts only because the newer sheets can be pretty dense and are hard to needle when doing binding by hand, whereas I could use a serpentine stitch to finish a charity one. Your soft, well used sheets should make great string quilt foundations. Press well with a little starch after trimming to easily handled chunks, then cut your foundations. I learned that when I made a jacket out of a log cabin variation. I used up some fabrics I didn't like that much but they were the right colors. They looked great in the finished jacket. It's one of the things I really like about string quilts. You can use up so many scraps and fabrics you might otherwise not use. I use the thinnest tissue paper I can find. 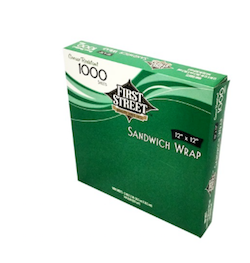 Usually get it at a big box store and they sell it in boxes of 1000 sheet. BUT I just share with friends. OLD phonebooks (at least 1 yr old to make sure the ink is set) are not bad either. I personally don't like the extra weight that a fabric adds to the blocks, and dryer sheets are ok, but still pretty darn thick. 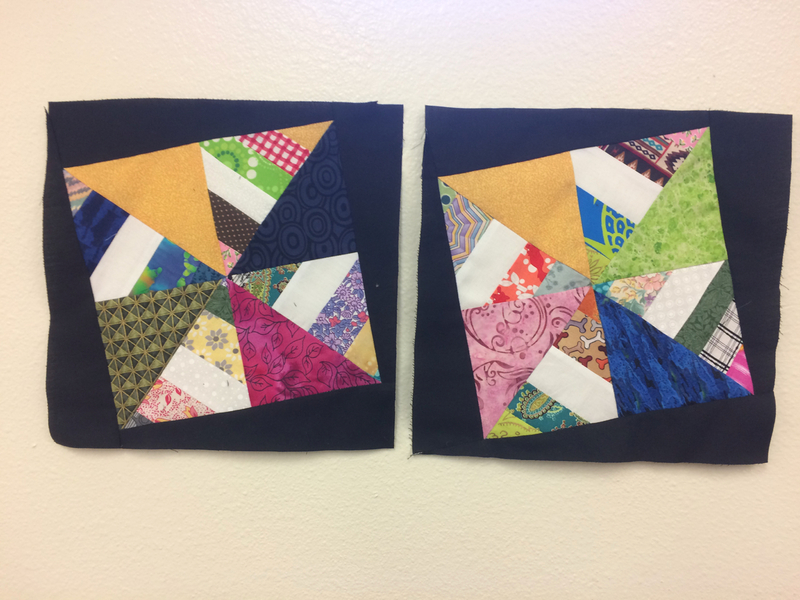 The idea is to make the Paper Pieced blocks (PP) with the least amount of bulk possible, to avoid quilting issues later. I make string blocks all the time as leader/enders when sewing other quilt blocks. I sew other blocks to the tops and cut like a HST. I've used them to make star points around a square. SO go for the gold on your string blocks. Great way to use up your smaller strips and they don't have to be the same width either.